Next stop: Israel. 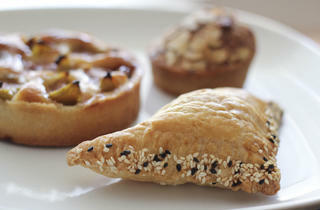 Homesick Israelis find flaky burekas, homemade hummus and Middle Eastern morning eggs at this best brunch in LA for a taste of Israel. Some of the best things in Los Angeles are hidden in mini-malls. This French-style bakery is concealing yet another layer—an Israeli breakfast that is equal to anything served in the cafes along Dizengoff St. in Tel Aviv. Two eggs any style are accompanied by a dizzying array of little platters that contain house-made hummus, herb-topped lebneh, apricot jam, olives, feta, a cucumber and tomato salad and a basket of fresh bread (the staff loves the whole wheat!). Also included is a glass of lemonade and a coffee. The owner immigrated from Israel a decade ago and worked as a high-end pastry chef and a private chef before opening this bright, modern spot which attracts slews of homesick Israelis. 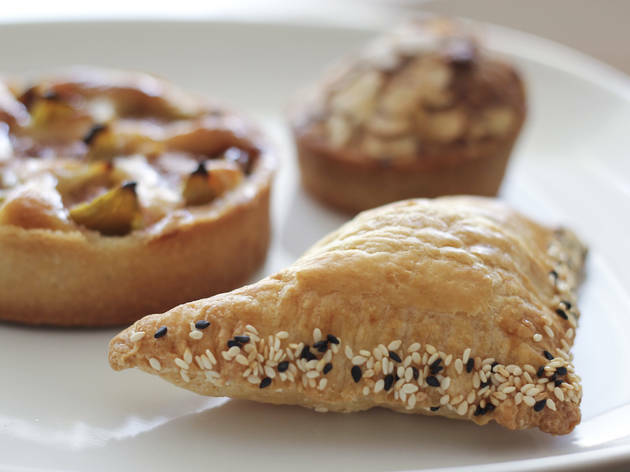 The regulars banter in Hebrew and take home boxes of straight-out-of-the-oven burekas, a flaky filo triangle stuffed with feta and edged with sesame seeds. Breakfast served all-day: Mon-Fri 8am-6pm; Sat, Sun 8am-5pm. 9123 W. Olympic Blvd., Beverly Hills, 90212. 310-550-0011.